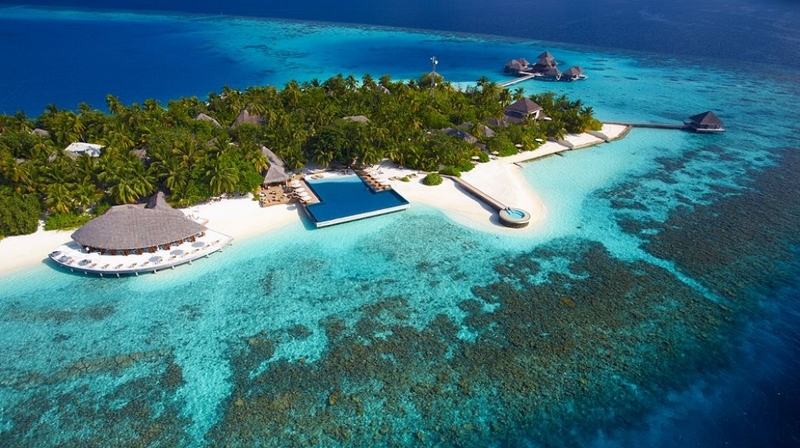 Set within its very own lagoon, Huvafen Fushi is a naturalist�s wonderland where the stunning environment � above and below the waterline and is the ultimate in desert island style and has the world's first underwater spa. 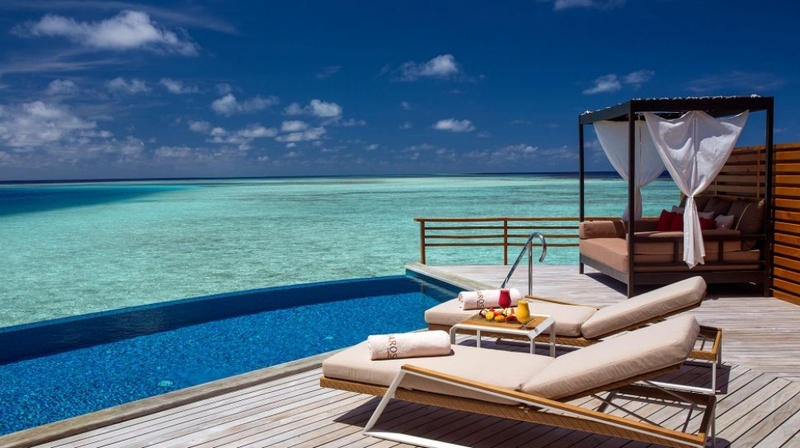 A surreal Maldives luxury resort in the North Malé Atoll. 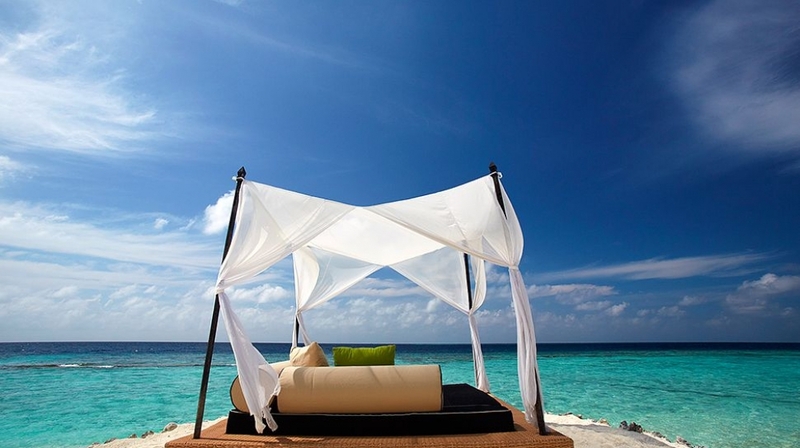 In the local Maldivian tongue, �Huvafen Fushi' means �Dream Island'. Shape your own fantasy in a bold realm of freedom set against the canvas of the Indian Ocean. This is how the dream starts. Soaring over the sea, gaze down at rings of islands in circles of white and brilliant blue, piercing eyes like strings of Turkish amulets. 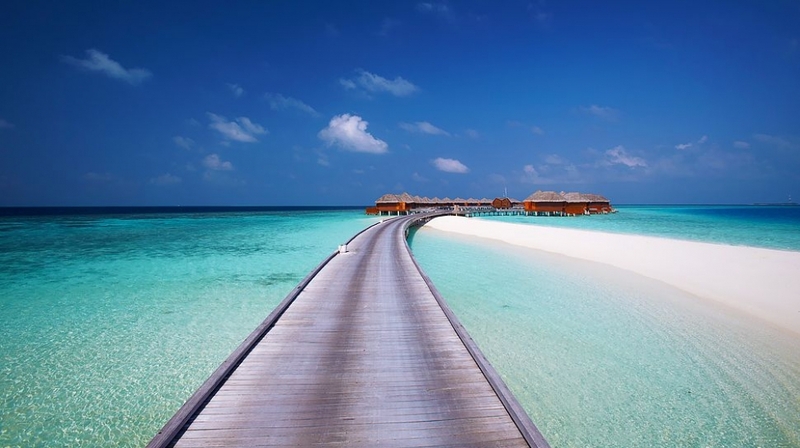 Touch down on the runway, its path the red carpet to your Maldives getaway. Skip over the waves in your aquatic limousine. 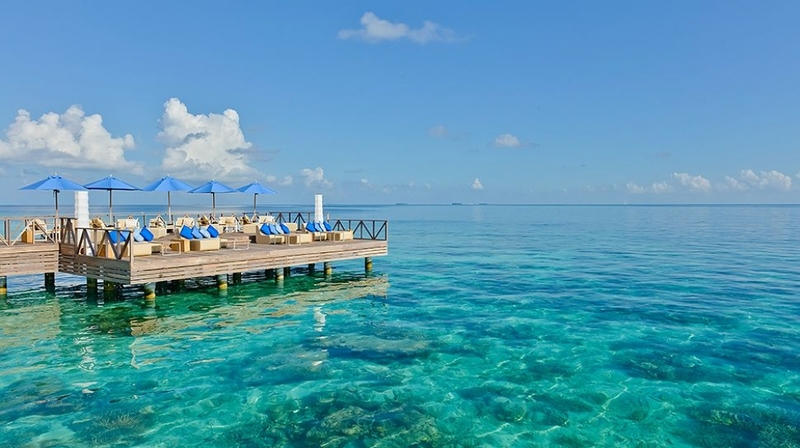 On shore at PER AQUUM Huvafen Fushi, the waking dream becomes even more surreal. Float at infinity's edge. Spa underwater. 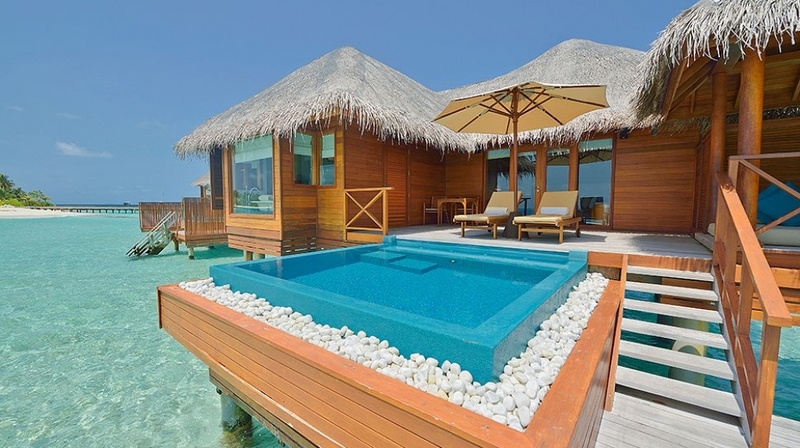 Swim from your villa's interior to cascading decks. Huvafen Fushi promises a contemporary retreat with superb staff and the world's first underwater spa.The large lagoon-like infinity-edged pool blends effortlessly into the blue horizon of the Indian Ocean and is surrounded by four-poster day beds; by night, it's romantically lit with fibre-optic lights. This wonderful island simply oozes with romantic touches. 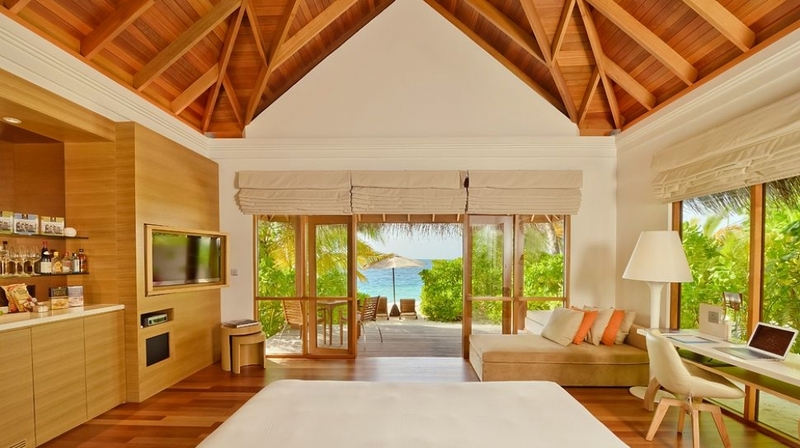 Huvafen Fushi offers guests 44 �naturally modern� private beach or lagoon bungalows and pavilions, each room showcasing its own distinctive design style. 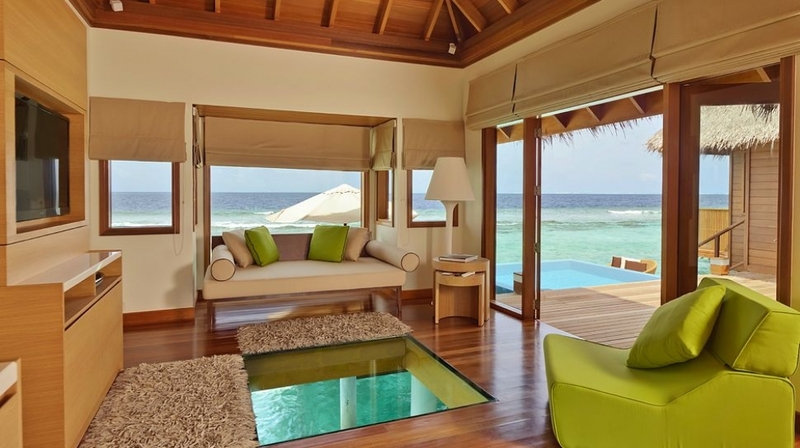 Every room has its own private plunge pool. 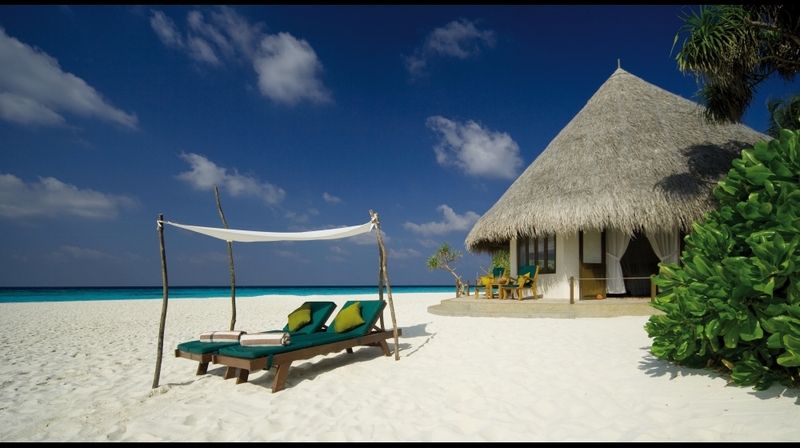 Deluxe Beach Bungalows sit right on the white sands, and rewards guests with spacious private outdoor areas. All rooms are equipped with air-conditioning, oversized beds, Frette linen and their very own plunge pools with private sun bathing decks. Rooms feature LCD TV�s, DVD/CD players, Bose sound system with pre-loaded iPod and dock. 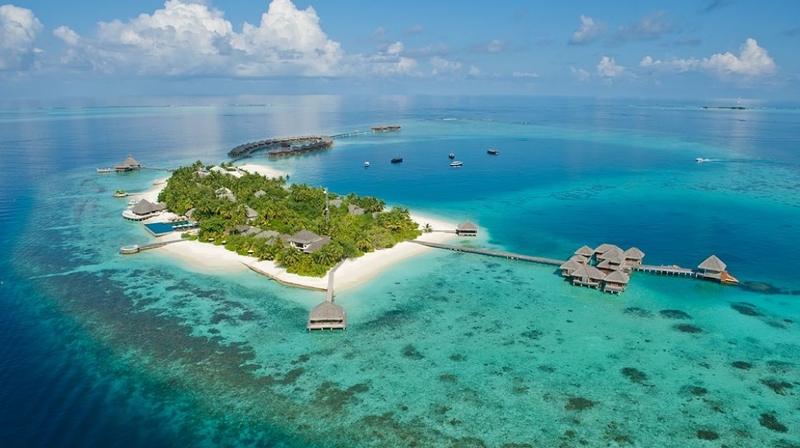 Set within its very own lagoon, Huvafen Fushi is a naturalist's wonderland where the stunning environment � above and below the waterline � is an attraction in itself. Managing company Per Aquum, has recently re-developed the island to meet its exacting standards of luxury and impeccable service with a multi-million dollar project. 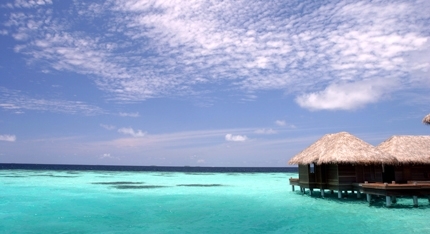 Huvafen Fushi also has the world's first underwater spa treatment rooms. Its luxury Spa showcases Per Aquum's new spa brand, Lime, which specifically tailors treatments and therapies to individual needs. Alternatively go poolside where the large lagoon-like infinity edged pool melts into the horizon and is surrounded by four-poster day beds. Celsius: Celsius Open and easy, outdoor or indoor, Celsius, brings a luxe-but-laid-back attitude to dining for breakfast, lunch and dinner. Branching out over the lagoon with a white sand floored deck, Celsius delivers the finest taste sensations of international cuisine. 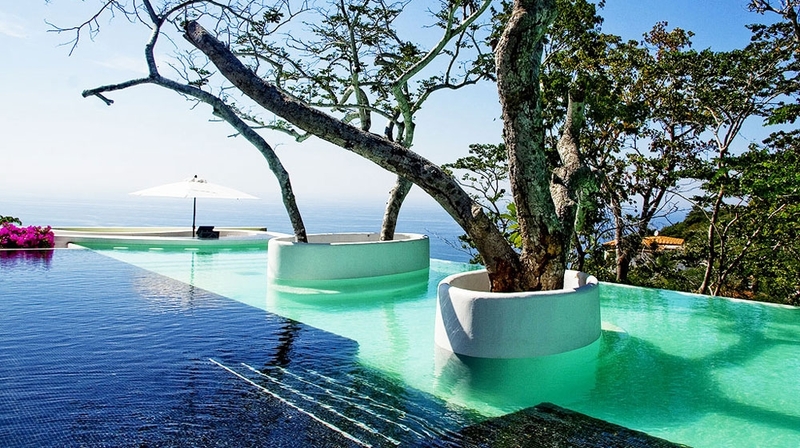 UMbar: On the water�s edge overlooking the breathtaking infinity pool, UMbar serves up pure tranquility. Indulgence waits for you in a Huvafen Fushi designer cocktail. Raw: Minimalist decor for simple-but-dazzling food. Raw offers innovative �spa� and �raw� cuisine with a refreshing juice bar. Sensational fare for those who care about their bodies, yet eschew the bland and boring. Vinum An unsurpassed selection of wines from the Old and the New Worlds. Meticulously sourced from all corners of the world by our international wine consultant. Private wine testing session and dining options dining options at the �Round Table� will awaken your senses as our Island Sommelier takes you on a journey of all things vinum. A dedicated butler or Thakuru is on call 24 hours for guests staying in the Two bedroom ocean pavilions with pool, Two bedroom beach pavilions with pool or the Three bedroom cube with pool. Pricing for all Bungalows is inclusive of buffet breakfast for 2 adults and 1 child. Second child is on request and chargeable. By Air: On your arrival at Male International Airport you will be met by Huvafen Fushi�s Airport Host who will guide you to your transfer. 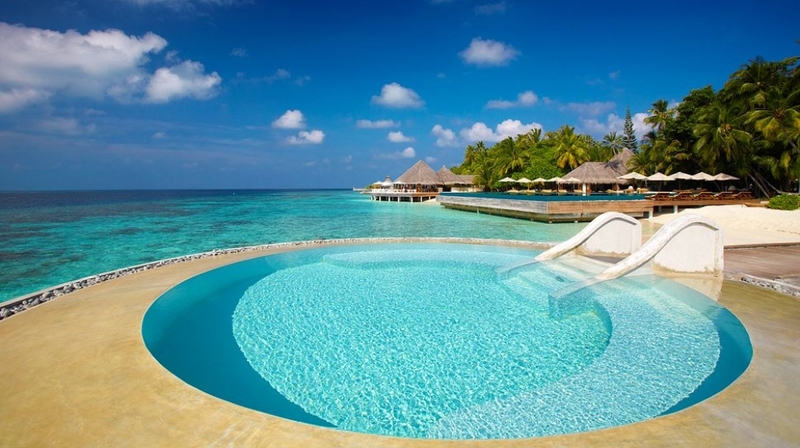 By Boat: Huvafen Fushi is in North Malé Atoll of the Maldives. Your Maldives experience begins with a breathtaking 30-minute speed boat ride from the airport. For those who prefer to fly you can take a 15 minute charter sea plane transfer across the atoll.